MASSGRAV sound so angry and incensed that while listening you are likely to start feeling like you have come under attack. All their rage and venom is couched in furiously paced thrash that spits out of the speakers the same way bullets spit out of high caliber weapons. Twenty-seven songs in only 19 minutes - you get the idea. 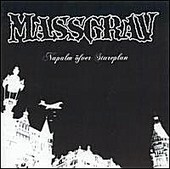 I hate to compare MASSGRAV to another band, but this is like listening to UNCURBED going on a rampage. After listening to this I have an idea of what it must feel like to be Evander Holyfield's sparring partner. I know you can't see me as I type this but I am giving MASSGRAV a standing ovation.